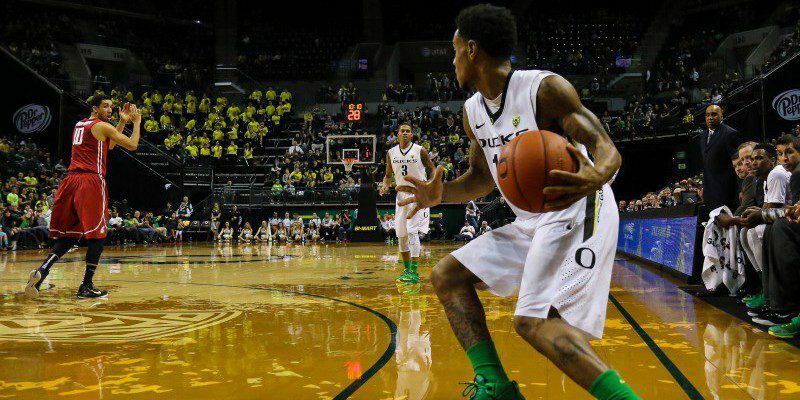 Last night the Oregon Ducks walked away with a W after beating USC 80-75. Now the Ducks are preparing to face UCLA this Saturday in California. This season hasn’t been bad for Oregon; their offense is full of ridiculous amounts of talent and although their defense needs some improvement, they are a well-rounded team. There are only six games left in regular season for college basketball and four of Oregon’s six games are on the road. The Ducks are 6-1 at home in the Pac-12 but have struggled on their opponents’ turf throughout the season and are 1-3 on the road in the Pac-12. This weekend’s game will be the second time that Oregon has played UCLA this season; they won 82-64 in late January. As the NCAA (March Madness) Tournament comes closer and closer, wins and losses start to be more and more crucial. The Ducks have made it to the NCAA Tournament the last two years. Will they make it a third year in a row? In order for them to make it to the tournament they absolutely have to win on the road. In their next four road games the Ducks will be facing UCLA, Cal, Stanford, and will end the season against Oregon State. Freshman forward Jordan Bell slammed down a dunk on the Washington Huskies last week. According to an article on statesmansjournal.com, the Ducks have had a fairly good season for having such a young team. There are four freshman that play significant minutes for the Ducks: forward Jordan Bell, forward Dillon Brooks, guard Ahmaad Rorie and guard Casey Benson. Of course, their young players don’t encompass the talent of the entire team; junior Elgin Cook has been playing a little better each game, averaging 12.5 points per game and 5.6 rebounds per game. And then there’s senior guard MVP Joseph Young. Young is without a doubt the leader of the team on the court. He averages 19.7 points, 4.7 rebounds and 3.7 assists per game. The Ducks’ next game is this Saturday against UCLA in Los Angeles, California at 12 p.m. Tune in to see how they do on the road and watch as they battle to make it to the NCAA Tournament for the third year in a row!